The EPATT program partners with families to facilitate the development of student study skills, life skills, academic skills and tennis skills. We promote healthy lifestyles, strong parent advocacy and empowerment, and students achieving their highest level of individual potential. Registration at EPATT is considered a partnership on the part of parents or guardians and students in working to fulfill the objective of the program. As a parent or guardian, it is critical that you have clearly defined goals for your child, are implementing the goals at home, and communicating with all of the adults who are impacting your children including teachers, EPATT staff, coaches and other instructors. Our desire is that you communicate positively and effectively with the EPATT staff about your student’s progress as well as about your participation in the program. Working together, we can be a strong influence on students becoming better educated and more mature by modeling adult working relationships based upon civility, honesty, and respect. East Palo Alto Tennis and Tutoring is a nationally recognized program. It has been named one of the top three tennis and tutoring programs in the country. As a program, EPATT provides one-on-one academic tutoring, tennis instruction, supervision, mentoring, life skills, enrichment activities, parent education, college admission assistance and much more! As a non-profit organization, EPATT must raise over $700,000 per year in order to provide these services. EPATT spends an average $7,000 per child per year. Therefore, every child who is accepted into the EPATT program receives a $7,000 scholarship for participation each year. Please note that most families are not admitted immediately and will be added to the waiting list. Once space is available new families will be admitted in the fall, winter, or summer. Parents can call and receive an application via fax to 650-724-7083 or complete one on the EPATT website at www.epatt.org. The EPATT program reserves the right to deny admission or participation to anyone. However, this organization does not discriminate and no one will be denied the privilege of participation based on gender, religion, beliefs, national origin, or ethnic group. For returning students, a GPA lower than a 3.3 on the ERC, for new families a GPA lower than a 3.3 on the spring or summer report card. A continuation of the above actions could result in expulsion from the program and revocation of the scholarship for the year or permanently. At the beginning of each academic year, parents are expected to establish academic, tennis, and fitness goals for their children. Implementation of these goals varies by age and child, so it is very important that parents communicate with schools, EPATT, and other activities that students participate in. Report cards, progress reports, and standardized tests like the CAASPP (Smarter Balanced Assessment), PSAT, and SAT, as well as IEPS provide information about how and what students are doing in school, their basic skills, what specific help they need, and their overall preparation for college. You are required to review this information yourself and bring a copy to EPATT. Progress reports must be signed by all teachers and parents. Please take the time to look over the progress report and speak with your child about their progress in school. CAASPP - Smarter Balanced Assessment results are due at the first parent meeting of fall. PSAT and SAT test results are due as soon as the results are available to parents (or students). Teachers expect parents to communicate with them about their child’s performance in the class. In addition, school administrators and faculty understand that the success of the students depends heavily on parent involvement. Therefore, parents are expected to attend all Open Houses, parent-teacher conferences, and make regular contact with teachers. They can also get involved in Parent-Teacher programs or other activities specifically for parents. 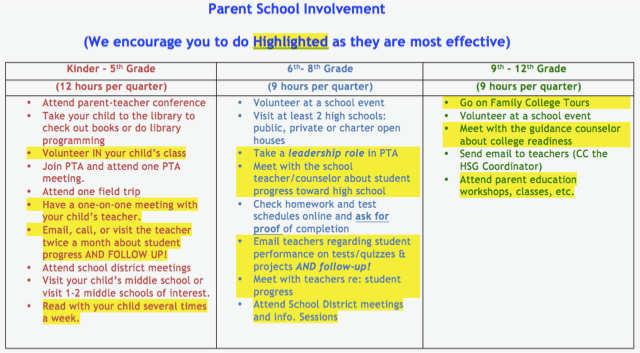 The purpose of parent meetings is to keep parents involved in and informed about EPATT. A lack of proper information leads to confusion and frustration. Therefore, all meetings are MANDATORY. Exceptions will be made in cases of family illness or emergency. EPATT does not pick up the office line on the meeting days. If you know that you are going to be late for a meeting, please call by 12pm the day before the meeting day or send a note with your child before the meeting date. If you arrive more than 15 minutes late, you are required to attend the make-up meeting. If you are going to be absent, please call no later than 2pm the day before the meeting or send a note with your student before the meeting date. There will be one make-up meeting per quarter. Also, families are only allowed to attend one make-up meeting per academic year. Your child may not come to EPATT until you have attended the make-up meeting. Arriving fifteen minutes late to a make up or failure to attend a make-up meeting will result in the loss of your EPATT scholarship for the academic year. Coming to a make-up meeting will be recorded negatively on the EPATT Report Card. Please inform EPATT by 12pm the day before the meeting if you are sending someone in your place to attend an EPATT meeting. Meeting policies still apply for substitute persons. One-on-one meetings with the EPATT staff occur as needed. Please come prepared when you request a meeting with the staff (read tutor logs, look at grades and progress reports, etc.). Parents who have concerns should schedule a one-on-one meeting with the staff. Please do not come unannounced for a one-on-one meeting as this may interfere with other pre-scheduled staff duties. The purpose of parent workshops is to help parents acquire skills and get practical information that will help them advocate effectively for their children and achieve their academic, athletic, and social/emotional goals. To enter "Parent Involvement Hours" click here and fill out the form. Para entregar sus "Participacion de Padres" oprime aqui y llene el formulario. Please bring HEALTHY MEALS. DO NOT send students to EPATT with SODAS, CHIPS, CANDY, PIZZA or ANYTHING WITH PEANUTS. Also, DO NOT give your children money to “buy snacks.” Any junk food will be confiscated by the EPATT staff. All parents with students who participate in the K-5 group are expected to bring snack at least once a quarter. Bring snacks for 40 students by 3:00 pm. DO NOT BRING SNACKS WITH PEANUTS, as many students are allergic. If you bring a hot meal, please inform the K-5 staff so that they can plan to serve the meal. All parents with students who participate in MSG and/or HSG are expected to provide dinner for students. Please prepare enough for 20 students and food should arrive by 5pm. All parents should check the FOOD CALENDAR to see what days they have signed up to bring snack/dinner. In the event that there is a natural disaster that disrupts normal EPATT programming, parents will be called and students will remain on the premises with a staff member until they are picked up by a parent/guardian. • Any change of address or phone number occurs. • Student is not living in parent’s or guardian’s home. If there is an earthquake, students and teachers will position themselves under the desks, tables, and counters for the duration of the quake. Afterwards, students, tutors, and staff will evacuate the building and proceed to the designated Emergency Assembly Point (EAP). The EAP is on the grass area called Templeton Plaza which is located between the Stanford Visitor’s Center, Track, Campus Drive, and the Tennis Stadium. Students are expected to remain in their class group so that attendance can be taken. EPATT conducts an Earthquake drill at least once a year. Signs are posted in the hallway and conference rooms to indicate the proper fire evacuation exit for each part of the Taube Family Tennis Stadium. Students are to follow the directions indicated on these signs and also directions given by the staff member in charge. Silence is observed during the entire time of the exercise. EPATT conducts a Fire Drill at least once a year. The schedule for each tier is designed to maximize the students’ EPATT experience. Students and parents are evaluated to determine if they are eligible to receive a $7,000 EPATT Scholarship for the upcoming school year. All families receive their EPATT Report Cards (ERCs) for Fall, Winter, Spring and/or Summer Quarters. These report cards contain letter grades (A, B, C, D, and F) in the four categories detailed in this handbook—Parent Commitment, Academic Impact Student Motivation, and Tennis & Fitness. Each category also contains sub-categories, which are graded on a 0 to 4 scale. A key is provided to clarify the meaning of each number grade. Please discuss these report cards with your child. Returning students must maintain at least a 3.3 throughout the school year to retain their EPATT scholarship. * New EPATT students must receive at least a 2.7 for their first quarter of participation, a 3.0 by their second quarter, and have to achieve a 3.3 by the end of their first full year to maintain their EPATT scholarship. *Exceptions will be made for juniors and seniors in good standing. 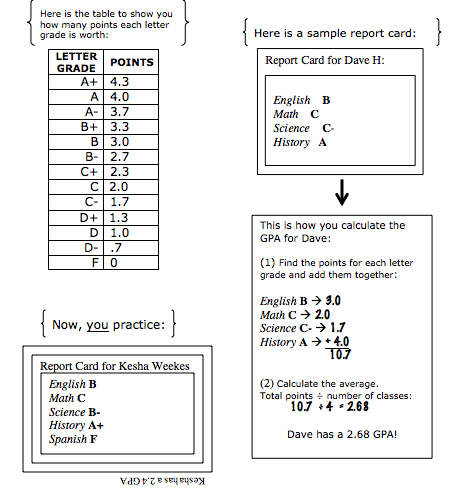 This “Overall EPATT GPA” is calculated by averaging the letter grades from the four main categories. A 3.3 GPA is the equivalent of a ‘B+’ average. Students who receive a GPA lower than 3.3 must petition to reapply for the following academic year. This is a breakdown of the categories on the EPATT report card (ERC). All of these categories are detailed in this handbook. Please be sure that you are familiar with how EPATT is evaluating whether or not our program is effective for you. The staff is always available to answer questions you may have about the EPATT report card. (1) Parents notify EPATT staff regarding student absences BEFORE 2PM. (2) Parents attend all scheduled meetings. (4) Parents attend all scheduled workshops. (5) Parents bring report cards, test scores, and/or IEP information. (6) Parents bring snack or dinner. (7) Parents pick up students on time and sign out regularly. (8) Student has satisfactory attendance. (1) Student's achievement in school is satisfactory or has improved. (2) Student brings organized backpack, completed, and school materials to EPATT. (3) Student makes progress in quarterly academic plan. (1) Uses tutoring time in EPATT wisely (does not waste time). (2) Student's attitude and effort during tutoring are satisfactory or have proved. (3) Student participates in EPATT enrichment activities. (1) Student has achieved satisfactory progress in the tennis curriculum. (2) Student puts forth effort and has a positive attitude. (3) Student is dressed appropriately for practice. The focus of this group is to develop and strengthen literacy skills, math skills, communication skills, and study skills. The focus of this group is to create a positive team environment for 6th-8th grade students, prepare them for high school, and teach them key life skills, study skills, and a mindset for success. In addition, students receive tutoring, enriching field trips, mentoring, and assistance with private school applications. The purpose of this group is to help 9th-12th grade students prepare themselves for the important transition to life after high school by providing exposure to career options and providing services for college preparation. Tutors are important assets in the improvement of your child’s academic performance. EPATT employs over 150 Stanford students and community volunteers to work one-on-one with your child a minimum of 2x per week. Students are paired with one tutor to help them exclusively for at least one quarter. All tutors are trained and supported by staff and provide feedback that helps EPATT to improve our services for your child. During tutor training, tutors take time to review your goals for your student as well as your student’s STAR test results, SAT results scores and report cards to develop an academic plan for the quarter. This plan helps the tutors to focus on the skills and deficient areas where your student needs the most help. Contrary to popular belief, the purpose of tutoring is NOT HOMEWORK assistance. Completing homework is the student’s responsibility. A tutor’s job is to help the student to think creatively, effectively, and quickly about what they are learning. Tutors can also teach students how to study properly and give tips that will put the student ahead of the class. If a student is taking full advantage of tutoring, he or she will improve in performance on tests and will always maintain a ‘B’ or better in all subject classes. The student is respectful, cooperative, and productive during tutoring. What is a productive tutoring session? 7th-12th graders should comprehend all assignments completed during tutoring. They should be able to pass a written or verbal quiz on the subject. Students will be given permission slips to be signed by parents and returned to the staff member responsible for the trip. A student cannot go on a field trip or tennis tournament unless permission has been turned in before the trip. Field trips are privileges given to students and students may be denied participation if they fail to meet academic and/or behavioral requirements, or fail to return permission slips by the deadline. Phone calls or handwritten notes will not be accepted in lieu of a permission slip. Students should attend at least one field trip per quarter. If a students does not attend a field trip that required pre-payment from EPATT, parents are expected to reimburse EPATT for the child’s cost of attendance. Students should attend one field trip per quarter. Tennis practice at EPATT is more than learning to play. The purpose of the EPATT tennis program is to promote personal growth and excellence. Our goal for each practice is to give our students program instruction in three areas: tennis, fitness and life-skills. Tennis is a mandatory activity at EPATT. Students are required to bring athletic clothes and tennis shoes (no vans, converse or running shoes). Each quarter, tennis programing will have a focus in the three core areas of tennis skills, life skills and fitness. Students will be graded based on their progress in the tennis curriculum. The EPATT tournament team is a committed group of student athletes that participates in extra tennis practices and private lessons with the tennis staff. Additionally, EPATT will support this team by sponsoring USTA membership and tournament entry fees. Practices and private lessons will be scheduled with the EPATT tennis staff. EPATT students’ tutoring days are pre-determined by the staff. This policy was instituted to balance the number of students at tutoring each day and to ensure maximum impact. Consult with the coordinator of your tier and if you need to make changes. After the second absence parents will receive a phone call or note home. A third absence will result in 0 credit for attendance on the EPATT report card. (4 = perfect attendance, 3 = 1 absences 2= 2 absences 0= more than 2). Excessive absences are grounds for a loss of EPATT scholarship. If your child has a school holiday and EPATT is open they are still expected to attend their scheduled tutoring day. However, if your child was absent from school or did not attend school due to illness or suspension, they may not come to EPATT. Students who arrive late to EPATT must report to the EPATT staff person in charge of their group. Students who arrive late to EPATT twice will be given credit for one absence day. (This does not include late EPATT vans). A tardy is counted as an absence when a student is 15 or more minutes late for tutoring. Students must arrive at EPATT through the back door, the official EPATT entrance. Please drop off students in the Sunken Diamond/Football Stadium parking lot. Do not pull up in the fire lane or near the front of EPATT, this will result in a negative mark on your EPATT Report Card. Egregious offenses will result in student suspension. Students may not be dropped off more than one hour prior to the start of EPATT, unless they have made special arrangements with the person in charge of their group. First-5th grade students should be picked up at 7:00pm on the tennis courts. First-5th grade students left here after 7:15 pm are considered late for sign-out. Sixth-12th graders should be picked up inside the EPATT facility in the Small Room. Before parents take their students home they must sign them out with the staff. Students can only ride home with people designated on the EPATT application. If someone other than the people you have designated comes to pick up your child he/she must present a note from you and a valid personal ID card. Please do not park in the fire lane or loading zone when picking up or dropping off your student. Also, do not park in the fire lane or handicap parking spaces in the Varsity parking lot near the football stadium and sunken diamond baseball park. Make sure students do not walk across the track, play on the track equipment, run up and down the bleachers, or play in the parking lot. Students who are participating in an after-school sport, meeting with teachers or participating in other extracurricular activities that will interfere with their regular EPATT schedule, must bring a copy of their practice and game schedule or a written notice of meeting times, field trips, etc. to their group coordinator. Such absences will not be counted against their total number of allowed absences as long as written notice has been provided. K-5th graders who participate in an afterschool activity that conflicts with their EPATT schedule must notify the staff before submitting a schedule change form. Inevitably, parents may have to change their EPATT days. Failure to do so will result in a loss of the EPATT scholarship for the entire year and they will have to re-apply for admission the following year. Students must maintain at least a 2.7 GPA to participate in a sport or extracurricular activity along with EPATT. Students with less than a 2.7 will be placed on academic probation and will have until their school’s next grading period to raise their GPA to a 2.7. If they do not raise their grades to a 2.7 or higher, they will lose their EPATT scholarship for the remainder will be determined by the tier head. EPATT SCHEDULE CONFLICT WITH AFTER SCHOOL SPORT/ACTIVITY? Parents/Guardians must call the EPATT Office at 650-725-4450, no later than 12 p.m. to inform EPATT that your child is sick. A 24-hour answering machine will take your message. Please DO NOT SEND YOUR CHILD TO EPATT WHILE THEY ARE ILL. If your child misses a week of programming because of illness, please bring a DOCTOR’s NOTE and EPATT will excuse the absences. For school events, please bring a copy of the program. In the event of a flu outbreak, EPATT may close down until further notice. SCHOOL HOLIDAY = COME TO EPATT! ABSENT/SICK/SUSPENDED FROM SCHOOL = DON’T COME TO EPATT! WHAT DO I DO IF MY CHILD HAS AN APPOINTMENT? PARENTS/GUARDIANS must call the EPATT Office at 650-725-4450 and leave a message no later than 12 pm on the day of the absence. A 24-hour answering machine will take a message. a. Come prepared, ready to work and be CHALLENGED! 3. Student will have a teachable moment conversation with EPATT staff member to discuss the behavior and steps for improvement. 5. Student will lose privilege (Tennis) and will do EPATT Community Service (cleaning counters,vacuuming, walls, etc.). 6. If behavior persists, staff member will call home for student to be picked up. incident.If a student reaches step #3, a behavior referral will be sent home. THEY CAN LOSE THEIR EPATT SCHOLARSHIP. One warning will be given (for 1st-2nd grade students, 2 warnings). If student is disciplined again,they will be asked to sit on the bench/bleachers quietly and after the appropriate time (2-4 minutes for 1st-2nd; 5-7 minutes for 3rd-5th), they will be able to rejoin the group. If student-receives further disciplinary-action, they will immediately return-to the bleachers/bench and will remain there until the end of practice. • Students will enter the vehicle, immediately find a seat, fasten the seatbelt, and remain seated throughout the trip. • Students will do as the driver requests. • Students will keep their area clean, will not eat or drink, and will keep their hands to themselves. Students who repeatedly fail to follow these rules will lose their van privilege. • Students must have a valid driver’s license to drive a vehicle on EPATT grounds. • All students who drive to EPATT should submit a photocopy of their driver’s license to the EPATT office at the beginning of the year or when they begin driving to EPATT. • General student parking is in the Sunken Diamond/Football Stadium. Parking is only free after 4pm. • The speed limit is 25 miles per hour everywhere on the Stanford campus. 10 miles per hour in the parking lot. • Students are not to use or go to their or other people’s cars during EPATT hours. Notify EPATT if any changes occur in this information. If your student starts a new medication, EPATT must be notified. If your cell phone or e-mail changes, EPATT must be notified. Please make sure all of the medical and contact information you give EPATT is current. Remember that your student is in our care for a portion of the day and we need to know how to reach you or your designated emergency contact at all times. Students are not allowed to come to EPATT until all forms are completely filled out! EPATT expects that parents or guardians will notify the staff IN WRITING regarding any medications and/or medical (including allergies), physical, or emotional issues of a student that may, in any way, affect his/her performance in EPATT or EPATT activities. Prior notification to the administration concerning such matters, even though they may appear minor, can prevent possible misunderstandings at a later time. If a student is using medication prescribed by a doctor, please notify a member of the staff in writing. Please try to avoid conflicts with your student’s EPATT tutoring schedule when scheduling medical or other appointments. If a student must miss an EPATT commitment, the parent/guardian must contact EPATT in advance. Please do not send your student to EPATT when they are sick! If they missed school, they should not attend EPATT! If a student starts to feel ill during their time at EPATT, he/she must check in with a staff person who will notify their parent/guardian. In addition, if a student is at EPATT and appears ill, any staff member may ask the student to contact his/her parents/guardian. EPATT staff will not give students medication without parent permission. If a student is injured during EPATT, they will be treated depending on the severity of the injury and an incident report will be filed. If an injury is serious, the proper authorities will be notified as well as the parent/guardian. For safety and security reasons, students are expected to avoid any unsupervised areas. They may enter EPATT buildings and classrooms only when the room is normally open and properly supervised. Students may not be in the parking lots during EPATT hours unless they are going to be picked up by a parent/guardian. If students in the 6th-12th grades desire to leave the EPATT boundary, they must be given permission from a staff member. Student attire should reflect self-respect, respect for others, and respect for the academic atmosphere of our team. Clothing and personal grooming should be moderate, in good taste, and without extremes. In other words…Clothes should fit neither so tightly that they cling to one’s body, nor so loosely that they cannot cover one’s underwear. Bare shoulders, bare midriffs, bare back, or bare upper thighs are not appropriate for the academic day. These policies are designed to help the students concentrate on their fundamental purpose during EPATT—learning. Pants (jeans, khakis, Dockers, cargo, corduroys, capri) or shorts. No hospital pants or pajama bottoms are allowed. Excessively baggy or tight pants are considered inappropriate. Skirts and shorts must not be inappropriately tight fitting. All shirts must fit such that the midriff is completely covered at all times. Shirts may be of any color or pattern, but may not have offensive logos or logos depicting violence, advertising alcohol, or drug use (including cigarettes). Excessively loose or tight shirts are considered inappropriate as are shirts that show cleavage. Shoes must be clean, in good condition, and worn with socks. Athletic shoes must be worn to tennis practice. All shoes must be close-toed, close-heeled, and fully constructed. EPATT requires all students to dress in athletic clothing. That includes shorts or sweat suit pants, t-shirt and/or sweatshirts. Tennis shoes are required for all the students for safety reasons and to protect the tennis courts. Please, no marking shoes. Students must meet the Dress Code standards in order to be at EPATT. If a student violates the Dress Code, the student may call home to have clothing brought in. Students wearing inappropriate t-shirts will be asked to turn the t-shirt inside out or it will be confiscated and returned to a parent/guardian. 8th-12th grade students have lockers for storing their belongings. Students are expected to keep their lockers locked and combinations private. Everything in the locker must be easily removable — not affixed with permanent tapes or glue. Food must not be left in lockers overnight (problems develop with ants, rodents, insects, odors, etc.). Opening another student’s locker without permission may be cause for suspension. Lockers are the property of EPATT and may be opened at any time by the staff. Students must have a locker consent form signed by their parents to receive a locker. There are Lost & Found bins located at the end of the EPATT hallway. At the end of every quarter, after parents and students have been notified, the contents of these bins are discarded. Any visitors to EPATT must sign in at the office and receive a Visitor’s pass (this includes family members that are not parents or guardians). Prospective students and families interested in applying to the program must schedule a meeting with the Academic Director before visiting the program or must be accompanied by a current EPATT parent/guardian. All those entering or leaving the building must enter through the back door, which is EPATT’s official entrance. Students may eat in the EPATT Courtyard, kitchen, or Koret Foundation (Small) room. No eating or drinking is permitted in the classrooms, hallway, or tennis courts. Students in the K-5th and MSG will receive snacks each day they arrive for tutoring. If a student arrives late to tutoring they may not get their snack until afterward. Students in the 6th-12th grades will also receive dinner after tennis practice each day. Cell phones and other electronic devices are not allowed at any time. They will be confiscated and returned to parents/guardians only. Students are allowed to have cell phones, but they must be off during EPATT hours of operation. If a student uses their cell phone while at EPATT, the phone will be confiscated and returned to a parent/guardian only. If parents need to contact students while at EPATT or vice versa, the EPATT office line can be used. No cell phone use on the vans! EPATT's mission is to change the trajectory of youth in our community the trajectory of local youth through academics, parent education, student advocacy and tennis. The East Palo Alto Tennis Program began in 1990 after two years of successful summer programs organized by Jeff Arons of the Youth Tennis Foundation, an organization that promotes tennis instruction for inner-city youth. After consultation with the superintendent of the Ravenswood City School District, four tennis courts were built on the site of the Ravenswood Middle School (now the Cesar Chavez Academy). By the spring of 1991, the program fielded a team of twelve players to compete in the middle school league and in sanctioned tennis tournaments throughout the Bay Area. In 1992, the program implemented an academic tutorial where 21 team members received academic assistance in a one-on-one relationship with a volunteer academic tutor. Since then, the program has grown tremendously. In 1995 the Association of Tennis Professionals honored EPATT as one of the nation's top 10 inner city tennis programs. In 1997 the program moved to Stanford University, and it now operates at the Taube Family Tennis Stadium. Today, approximately 100 students participate in both the tennis instruction and academic tutorial. In addition, more than 100 volunteers work with the program on a consistent basis. EPATT is affiliated with Stanford University, Stanford Athletics, USTA, Riekes Center for Human Enhancement among others. ADMISSIONS, STUDENT IN 6TH-8TH GRADE, OR EPATT ACADEMICS? VOLUNTEERING, EVENTS, MEETINGS, APPLICATIONS, TRANSPORTATION? CHILD SICK OR GOING TO BE LATE? TRANSPORTATION ISSUES? DINNER CALENDAR QUESTION? It is important that parents and students understand how to calculate a GPA. GPA stands for “Grade Point Average.” That means each letter grade is worth a certain number of points. You average those points to find out a GPA. A student’s GPA can be an important factor that decides what types of classes he/she takes as they move from one grade to another. GPA is also important for getting into college.